Arroz con Leche is one of my favorite Colombian desserts. This Colombian-Style Rice Pudding version is sweet, creamy and delicious. There are different variations of arroz con leche in Latin America, this is my family recipe and it is very easy to make. The rice pudding will thicken more as it cools, so be careful not to overcook. I hope you enjoy making my simple and easy Arroz con Leche recipe! Add salt, butter, vanilla extract, 2 cups of milk, and sugar. Stir well to mix and cook uncovered for approximately 15 minutes. Reduce heat to medium low. Add the remaining milk and condensed milk. Stir with a wooden spoon. Cook for 1 hour and 15 minutes, or until the rice pudding thickens to desire consistency. Stir well and remove from heat, and let it cool at room temperature. The consistency should be very creamy. Refrigerate for a least 1 hour or overnight. This is the best rice pudding I ever had…thanks. I had the same problem. Thank you so much for your respond, I really appreciate it. My son is making it for his class assignment. I’m about to try it right now but have always had crunch rice. I’m using instant fluffy white rice to see if that will do the trick ! The sugar has to be add it only at the last step or the rice don’t cook well. I cook the rice first with the cinnamon water and just until it’s completely done I add the milk. Did you wash the rice until the water ran clear before starting. I had the same problem of the rice being hard even after soaking it overnight. I researched it and it turns out sugar solidifies the starch in the rice, so the rice can’t absorb moisture as it normally does. So the solution is to not add the sugar or condensed milk until AFTER the rice is very soft. Its important to let it get rather mushy because it also hardens back up after its put in the refrigerator. With those two caveats, this recipe is delicious! I am sorry….I make this recipe at least once a month and the time is perfect…..I don’t use a gas range, but next time cook the rice over medium-low from step 2. Thank you and good luck next time. I LOVE rice pudding…… no i adore it!!!! 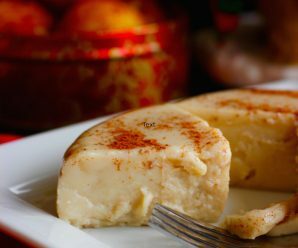 🙂 it tasts soooo good during the winter… i love to just get my bowl of hot rice pudding and curl up on my couch and eat it while i read a good book. This rice pudding here looks very yummy! Do you usually have it plainly or have you tried adding other ingredients to enrich it? Hello, I’m very happy I found this website. I’m American. My husband is COL. We live in Bogota; recently moved. I’ve tasted several arroz con leches here. This recipe has great flavor, but is very sweet for my taste. I have made rice pudding before and never use more than a cup of sugar. Anyway, thank you. Tomorrow, I’m going to try the sopa de lentejas. 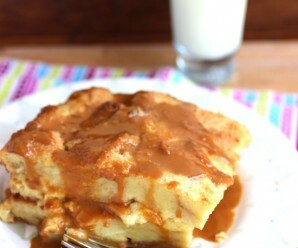 Hi, I am making this tomorrow afternoon for my Spanish class…we will see how it turns out, hopefully yummy!! I love the culture and the food so this is going to be a ton of fun for me! We are bringing this to a colombian party. It looks and tastes delicious. estoy haciendo esta receta para navidad! ya habia intentado esta receta y el arroz me quedo duro 🙁 pero esta vez esta perfecto! mi mama me recomendo remojar el arroz toda la noche y perfecto!!! i recommend soaking the rice overnight in water… it helped me! Patricia- Gracias por el comentario. 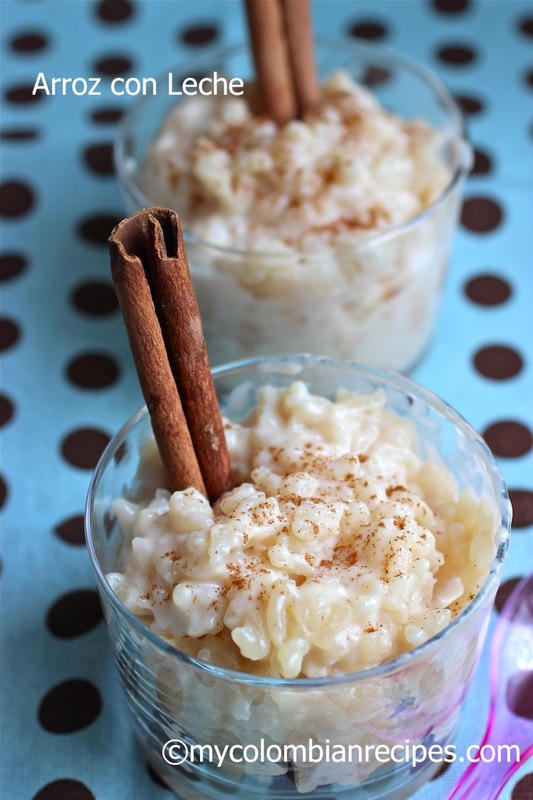 I love how there are sooo many ways to make rice pudding, one country, one home to the next! I made this one week ago, It was perfect…..the flavor is fantastic…..it was a hit at my party. I’m colombian but my husband is not. I love to get these recipes in english so I know exactly what to buy here in USA. sometimes thigs get lost in translation!! need ur help!!! just finished making the arroz con leche. followed every direction to the “T”. the rice is still kinda hard. what should i do? i dont want to throw it out cuz that will be a waste of money. the sauce has already thickened…is there any tips i can do to soften it up a bit? Christina- add more milk, stir really good and simmer. Add more milk until the rice is cooked! I made this rice pudding yesterday and I loved it, The flavor is amazing! I found that putting a lid on the saucepan (step 2, rice and cinnamon water) helped to ensure the rice softened enough within 5 minutes. Yes, amazing flavor! Favorite variations include substituting cardamom pods for 1 or 2 of the cinnamon sticks (my Colombian boyfriend loves this), or substituting a can of coconut milk for the condensed milk which makes it less sweet but just as rich! I made this rice pudding and it was fantastic.Delicious flavor. Thank you for your recipe. It was fantastic….I soaked the rice for 30 minute, before I cooked it. Great flavor! so i made the arroz con leche yesterday and my husband really likes it however he says it is really sweet and i had to add more milk to his serving and heat it to make it not so sweet. and i remember my suegra making it the same way but not putting in any sugar just adding the sweetened condensed milk. could i follow your recipe and just leave the sugar out so it is not too sweet for him??? Danielle- You can omit the sugar!!! I like it sweet, like my grandmother’s recipe. that’s what i will do the next time i make it. it is a little too sweet for my husband. thanks so much for the speedy reply. Hi, I have to make this recipe for class and it needs to be typed in spanish . 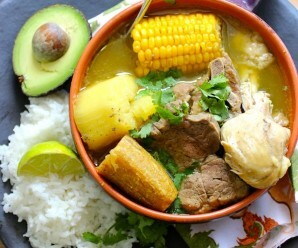 Do you know where I can get this exact recipe but in spanish ? Just Google translate it (but maybe check it first, they’re sometimes wrong. I just made the arroz con leche and I’m tasting it now. It is way too sweet. I realized that most condensed milk comes in 14 oz can and the recipe calls for 12oz. If you only have the 14oz can you can omit some of the sugar. Also, the temperature I thought was too high for low-med on my electric range. I found I needed to stir frequently otherwise the rice sticks at the bottom. So to remedy the sweetness I added some half n half, ran out of milk, and I reduce the temp setting to low. The rice doesn’t stick as much and it’s cooking thoroughly, less crunchy rice. I will make this again for sure. This rice pudding was so creamy and delicious everyone..You have to make this recipe…it is the best rice pudding! I just finished up making the arroz con leche. This is a wonderful recipe and it has amazing flavor. I’m a culinary student and enjoy learning about cuisine across different cultures. Thanks so much for this wonderful recipe! I made this for a party in Spanish class for our foreign exchange student from Columbia. Can’t wait to see if he likes it. It is a little sweet for my taste but delicious! I also had trouble with the rice being too hard, so I added about another cup of milk and simmered on medium for the last 30 minutes. I also added about a 1/4 cup of raisins during the last 20 minutes. Delicious! I am trying to make this recipe but for more people. Do you have any suggestions for me because it looks like the rice won’t soak up all the liquid. I would appreciate any help that you could give me. I’m from Bucaramanga now living in Canada and can’t wait to make my family your arroz con leche! However…I’m very health-conscious and was wondering if I could reduce the sugar down to about 1/4 cup? since some people mentioned it was too sweet.Thanks! Maria Carolina- You can use less sugar. I like mine sweet. hi im working on making this delicious desert but my fiance does not like butter on anything do i have to put butter? It tastes amazing thank you so much! Thank you for your recipe, I just finished making the arroz con leche and it is delicious. I’m not sure if this has been asked already, but do you use whole milk? We drink fat free and I was wondering if I would have the same results with it. Carolina, I used whole milk, but you can try it with fat-free milk. The whole milk makes a creamy rice pudding. 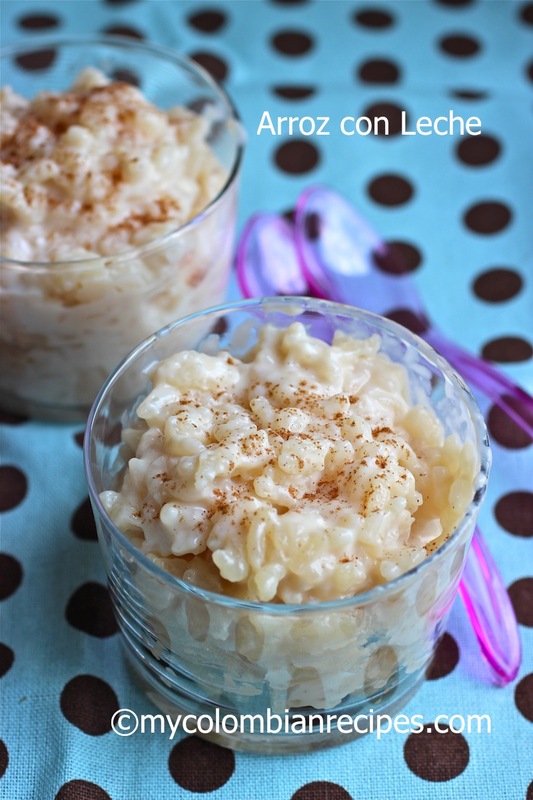 This is probably the best arroz con leche recepie I have come across. I did have a few grains of rice that were a little crunchy but still a yummy recepie. I miss Colombia a lot, but now after founding this lovely page with all kinds of precipices, I’m bit more happy! Just had the wonderful rice desert, my favorite! This was my first time ever making arroz con leche on my own, and a lot of people enjoyed it! Although I found it to be way too sweet for my liking. Very good recipe. The consistency and texture are perfect, nice and thick and creamy, and it was very easy to make. I did find it to be sweeter than I like, so next time I make it I will cut the sugar in half, at least. We made this recipe yesterday and it was very good. Sweet and delicious.Thanks. You have the best Colombian recipes. I made this rice pudding, Bunuelos and Arepas. Thanks. This is a simple Arroz Con Leche Recipe, is so easy, yet so satisfying. 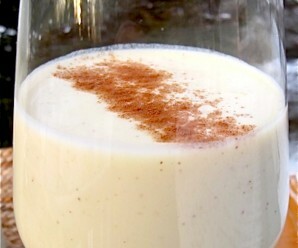 This is an easy recipe for homemade arroz con leche, I love this Latin dessert. It was very good. This is my theory on why some people commented on uncooked rice. Interrupting the cooking of rice will make it hard or impossible to finish cooking. Try this experiment. Cook some rice half way then let it cool, then start cooking it again; you will never be able to cook the rice completely. My suggestion would be to either heat your milk before adding it, or add it very slowly so the rice doesn’t get chilled while it’s cooking. I made this arroz con leche recipe and it was delicious. It’s sweet and creamy.Very good recipe. I am going to make it again soon! This recipe is delicious and I make it a lot. However, it is way too sweet. I completely omit adding any sugar and just use the sweetened condensed milk and it suits my tastes better. So, if you don’t like it super sweet that’s a good way to make it. Also if you own a rice steamer (like I do), you can boil the cinnamon sticks and use that water in the rice steamer to steam the rice, then add it back to the pot and do the milk thing. I made this arroz con leche recipe for a party and it was a hit. Sweet and delicious. 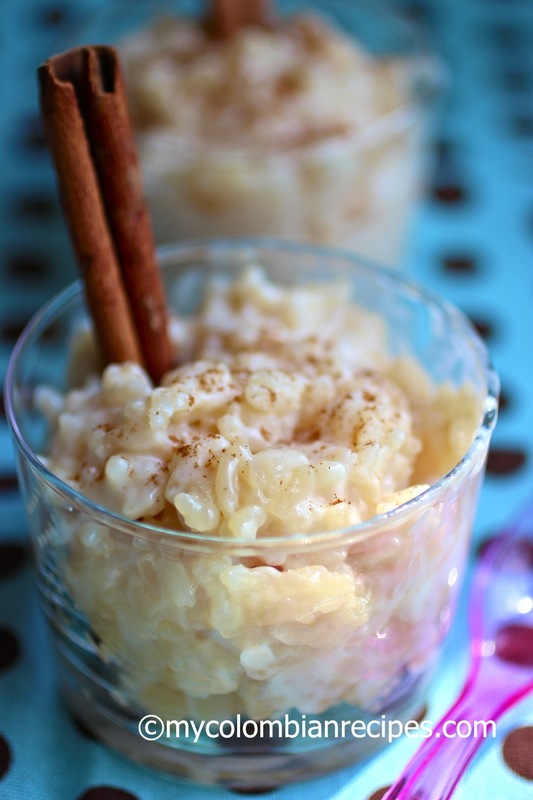 If you’re a rice pudding fan, this Arroz Con Leche recipe is one to try. It was delicious! I have made this twice for my dad who is from Colombia who has loved it both times I have made it. i was so surprised when i had rice pudding for the first time–i didn’t expect to like it but it was amazing! How much does this recipe make. Well, nevermind….I forgot I had to keep stirring it… Oops! I just finished it, Didn’t take but about 45 min. to cook….I could have let it cook for an hour, but we are ready to try it! Looks & smells YUMMY! Thank You for the recipe. Too much sugar on top of the whole can of condensed milk!!! I would not put sugar at all next time and only use the condensed milk…. Is the rice already cooked when added with cinnamon water in step 2 or boil it as the cinnamon water is boiling then add them together in step 2? Yes, you can use short grain rice. This dessert is wonderful . I made it 10 times and I love it more every time I make it. It’s sweet and creamy. Very good! Very easy to prepare! Delicious. I would also suggest to soak rice overnight. This is very easy to make, and very good! Wow , so I made this tonight for a dessert and I added some coconut to it, tasted awesome kids loved it , will make again soon!!! El arroz me quedo espectacular! Con un sabor delicioso, especialmente siendo primera vez haciéndolo. Gracias por la receta, a mi esposo le encanto. I will be making this for my Spanish class, for about 30 people. How many servings do I need? I made this recipe before, this time on a gas range. After letting it refrigerate it is less creamy then before, is there anyway to reverse this by adding more milk? I cook the rice a bit in the cinnamon water and add only 1/2 cup sugar. .. turns out perfect every time! I’m Italian but my Colombian and Puerto Rican friends love this recipe too! I found this recipe today. Omg! This is so good. I microwaved the rice in water while the water and cinnamon sticks were boiling. It worked out perfect. Rice was very soft not crunchy at all. My mom is from Cali and this is how she makes it. First of all we let the rice SoCal over night (2cups) then the next day we put one cup of water with two cinnamon sticks to boil. Once the water is brownish we add 10 cups of milk. Once that gets foamy or boils we add the rice. After it gets a little heavy we add coconut shavings(optional) and leche condensada. Then keep mixing for another 10-15 mins. We also believe that only one person should be mixing the pot *with a wooden spoon too!